After over a year of planning, countless emails, pitches, grant applications, conference calls, and meetings, the day to hook up the Airstream and hit the road arrived. To relive how this project came to be, click back to our “Planning the Impossible” post from earlier. Like anything extensive you plan for, you’re still not ready when the day comes. So, knowing we had time before our first state project of Vermont, we pushed back the launch date a few days. In retrospect, the days leading up to our departure seem like total blur of appointments and packing. Fortunately, we were in good company. My parents’ house was chock-full of people. My aunt and cousins from Mexico were visiting so the house had a total of seven people living in it. Lucky for us, they all generously offered to help so we had seven pairs of hands put to work. Looking back on it, it truly was a special time that I’ll always remember: my father helping us put the [HAS HEART] decals on the Airstream, my mom and aunt doing loads of laundry for us because we were so busy, and my three younger cousins helping carry armfuls of things while packing up the trailer. The next day we made the final ascent up the driveway to the Airstream, carrying last-minute items such as a roll of paper towel and the bottle of tequila my aunt gifted us. You know, the essentials. With my parents on either side of me, we walked up the driveway silently with Tyler in back of us, making sure to be in the perfect position to capture the moment on camera as he always manages to do. After putting Noel into her crate in the backseat and a tearful goodbye to my parents, we were officially on the road. I’ll admit here that I am very attached to my parents, perhaps to a fault, but when you have the world’s best parents like I do who are also two of your best friends, I’ll challenge you to not get attached. Needless to say, it was a difficult goodbye. It didn’t take long for Noel to start voicing her unhappiness of being contained within a crate. By the time we got to the Flying J’s truck-stop outside of Lansing 45 minutes later, she hadn’t stopped crying. We looked at each other both wondering if this was going to happen every time we were on the road, but neither one of us wanted to question it out loud. We couldn’t focus on the little cat dilemma too long as a new one manifested: the need for water. Before we left, we hadn’t filled our potable (drinkable) water tank before departing because, long story short, Tyler had to drive the Airstream to the Todd Wenzel Chevrolet dealership for a photoshoot the night before with our awesome photographer friend, Brad Gillette. Since my parents driveway is the narrowest, tree-lined, snake-shaped driveway imaginable, there was no way we’d be able to back it down again, especially at night. So we had to park it on the street, too far from a fresh water hose to fill it at home. Seeing as we’d be on the road for a couple of days, we knew we needed to fill it, but assumed there’d be plenty of easy spots to do so, right? Rookie mistake. So, there we were, walking around this giant truck stop looking for some sort of water spigot. A fellow RV’er took pity on us, asking if we needed help. I admitted this was our first day on the road with the trailer and that we needed to find water, to which let us know that the facility had closed down their potable water spigots a while ago. The next couple hours were spent pulling over in various places from Lansing to Detroit, looking for potable water. Eventually, we found a Walmart whose outdoor section had a garden hose outside in the parking lot. Was it 100% sanitary? Who knows and at that point, we didn’t care. For those of you who may be making contorted faces at our potentially low quality water standards, the hose we connect to the faucet has a filter on it and our kitchen sink also has a built-in filter — so technically, it was pure, double-filtered WalMart tap water. As Tyler filled up the tank, I popped inside Walmart to do some late night grocery shopping for a few basics: bananas, almond milk, cereal, and specialty RV toilet paper that is designed to be quick-dissolving so not to clog our black water tank and hose. At 1 AM, we finally pulled into Allen Park, MI, where my best friend Sarah lives. Somehow, a drive that usually takes about 2.5 hours managed to take us around 6-to-7 hours, but hey, we were learning and we had a screaming cat in the back seat. After squeezing into a small space across the street from her house, we beat the rain from a summer storm rolling in and finally hit the hay. A habitual shower-before-bed person, Tyler turned on the water heater, waited a little while, and then bravely became the first person to take a shower in the Airstream. After asking him how it went when he came out rather quickly, he responded with a shiver and said, “cold.” Come to find out, he didn’t actually have the shower handle pointed toward “hot,” so he would later be pleasantly surprised that we could, in fact, take hot showers. Phew. The next morning we woke up early to a warm, muggy Michigan summer day ecstatic to visit Sarah and her newborn baby Félix she and her husband Pablo had welcomed into the world just two weeks before. After a delicious breakfast of coffee, avocado toast, and some berries, we went up to Félix’s nursery to relax in his air conditioned nursery. He was a colicky baby that liked to be held and rocked, so I chatted with Sarah as she bounced on her medicine ball with him in her arms. It was hard knowing that we would be leaving within the hour and that the next time I would see him, he’d have grown so much. Eventually, we took photos together and exchanged our goodbyes. As she stood waving goodbye from her front step holding Félix, we pulled out and within minutes we were on the bridge to Canada. After a few hours of playing let’s-guess-how-fast-we-should-be-driving due to our truck not having the kilometer conversion in the speedometer, we arrived at the campground we’d be staying at for the night, the Rock Point Provincial Park located on Lake Erie. Now, what happened next is still a bit of a sore subject as we had just embarked on the road with a shiny new Airstream and truck, but after a few minutes of Tyler backing the trailer into our campsite and me attempting to guide him in, the back corner of the truck hit the front corner of the trailer perpendicularly. I can still hear the terrible noise of the back tail light cracking. 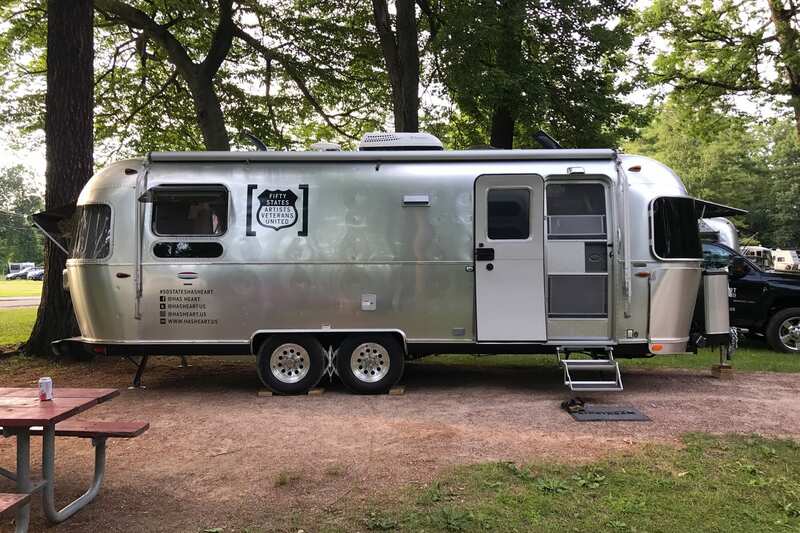 Fortunately, it was a very minor situation and you can barely see the dent on the Airstream or the crack in the tail light, but it was definitely a reality check for us to the new lifestyle we were committing to. After our little mishap and then a quick set up, we hopped back in the car and drove to Niagara Falls and they did not disappoint. Although completely swarmed by tourists, the powerful sound of the falls muffled the sounds of the crowds and were mesmerizing. For a couple hours we walked along the falls while watching the crashing turquoise waters and feeling the rising mist. The next morning we awoke in the beautiful campground and had our morning coffee while walking along the shores of Lake Erie. It would be a long time before we’d see another Great Lake. We later packed up and headed toward Vermont, making our way across the surprisingly long state of New York. Eventually, late in the night, we arrived in Button’s Bay State Park, just south of Burlington, Vermont. In the morning we woke up to teenage park employees riding around in what seemed to be an unmuffled golf cart picking up trash and litter. Since we had squatted there overnight without even unhitching, we hightailed it out of there as soon as we woke up and finally rode into Burlington by mid-morning. While waiting for a site to open up at North Beach Campground, we sat along the campground beach on Lake Champlain in a blowup blob chair that our friends gave us as a wedding present, which was an event in and of itself to inflate by spinning around in circles trying to capture enough air to buoy ourselves up off the sandy grass. Once we made fools of ourselves blowing the blob up enough to not sink in it, we had a moment where we couldn’t believe that just a couple of days ago, we were just sitting with family having a pizza feast, while the day before, we were in front of Niagara’s massive falls. The world felt small and large in that very same moment — a sentiment that we’d often come to feel throughout the tour. Without spending too much more time pondering life’s big questions, we got our home setup and settled-in for our four-night stay where we were able to go for a run/walk (OK, mostly walk) along a converted railroad trail, brave the chilly water for a quick dip, and catch a Vermont summer sunset over the lake. The next couple days were spent working “from home” and out of local coffee shops and walking all over the beautiful little town of Burlington. A fan of planes, trains, and (floating) automobiles, Tyler loved sitting along Lake Champlain watching the steamboat launch and the trains roll by. Just a quick walk away, the picturesque Church Street Marketplace provided us with delicious Ben & Jerry’s ice cream and a sort of hilarious painting of Bernie Sanders within a mural, waiving with a very short arm. Church Street is freckled with giant local quarried boulders to pay homage to Burlington’s location within Champlain Valley. We were wondering why these giant rocks were everywhere, so we asked. The more you know! With it being our very first state project in the tour, we unfortunately didn’t have a lot of time to explore other areas of Vermont. Yet, on our way in, out, and through it, we did experience the beautiful obstacle-course Vermont’s landscape naturally provides. It was a good test for us RV rookies. We’ll be back for you, you Green Mountain State, you!